The words "Harper Government" have been replacing the more traditional "Government of Canada" in some recent federal communications. First it was the "Government of Canada." Then it was "Canada's New Government." Now it's the "Harper Government." Public servants from four different departments have confirmed to The Canadian Press that they received a directive late last year that the words "Government of Canada" in federal communications be replaced with "Harper Government." 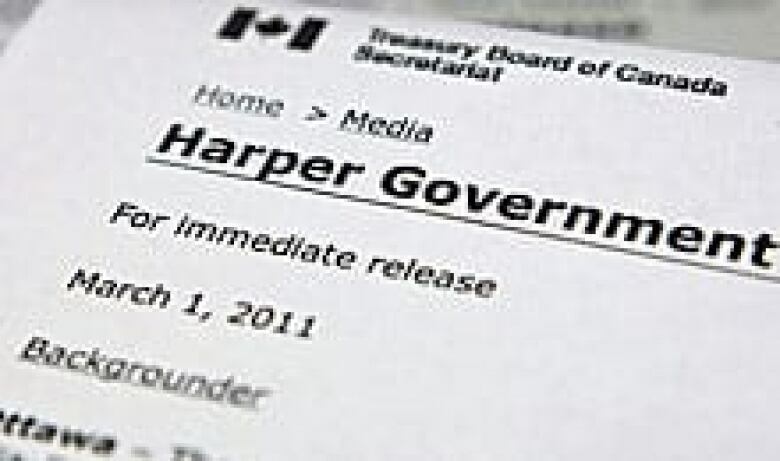 The "Harper Government" moniker rose to prominence in 2009 when its use was noted in light of a controversy over Conservative MPs posing with giant, mock government cheques bearing the party logo and MPs' signatures. The practice was stopped for a time. Since December, the "Harper Government" has been showing up again in government communications. Dimitri Soudas, Harper's spokesman, said in an email that the style "is a long-standing practice that accurately reflects the government's leadership, regardless of who is prime minister." But the opposition said the move is unprecedented. "It's not Stephen Harper's government, it's the goverment of all Canadians," Liberal MP Dominic LeBlanc told CBC News. "You'd expect this kind of directive to be issued by the ministry of information in North Korea." The minister in charge of the public service, Treasury Board President Stockwell Day, shrugged off the directive. "If you think you're on to something that is going to ignite people from coast to coast in a fury of rage, maybe we'll look at it. But this is the first I've heard of it, so good luck with it," Day told CBC News.